Nuts are nature’s way of showing us that good things come in small packages. These bite-size nutritional powerhouses are packed with heart-healthy fats, protein, vitamins, and minerals. Here’s a look at the pros and cons of different nuts, as well as the best and worst products on supermarket shelves today. Of course, you can get too much of these good things: Nuts are high in fat and calories, so while a handful can hold you over until dinner, a few more handfuls can ruin your appetite altogether. And although nuts are a healthy choice by themselves, they’ll quickly become detrimental to any diet when paired with sugary or salty toppings or mixes. All nuts are about equal in terms of calories per ounce, and in moderation, are all healthy additions to any diet. “Their mix of omega-3 fatty acids, protein, and fiber will help you feel full and suppress your appetite,” says Judy Caplan, RD, a spokesperson for the Academy of Nutrition and Dietetics. Ounce for ounce, macadamia nuts (10 to 12 nuts; 2 grams protein, 21 grams fat) and pecans (18 to 20 halves; 3 grams protein, 20 grams fat) have the most calories—200 each—along with the lowest amounts of protein and the highest amounts of fats. While all nuts contain heart-healthy omega-3 fats, walnuts (14 halves contain 185 calories, 18 grams fat, 4 grams protein) have high amounts of alpha linoleic acid (ALA). 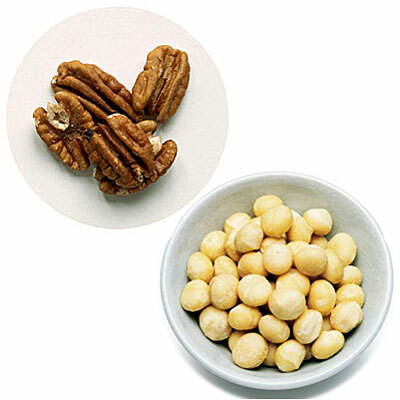 Research has suggested that ALA may help heart arrhythmias, and a 2006 Spanish study suggested that walnuts were as effective as olive oil at reducing inflammation and oxidation in the arteries after eating a fatty meal. The authors of this study, funded in part by the California Walnut Commission, recommended eating around eight walnuts a day to achieve similar benefits. Technically legumes but generally referred to as nuts, peanuts are high in folate—a mineral essential for brain development that may protect against cognitive decline. (It also makes peanuts a great choice for vegetarians, who can come up short on folate, and pregnant women, who need folate to protect their unborn babies from birth defects, says Caplan.) Like most other nuts, peanuts are also full of brain-boosting healthy fats and vitamin E, as well. One ounce of peanuts (about 28 unshelled nuts) contains about 170 calories, 7 grams protein, and 14 grams fat.